I do not like using anything but Nespresso pods by Nespresso in my Nespresso machine. Not only is the machine an expensive self-purchase, but I’m brand loyal to Nespresso (and so is my husband). So it takes a *lot* to convince me to swap my beloved Nespresso capsules for anything else – and I have frequently refused to. Refused every offer until now that is. I have a soft spot in my heart for Alma de Cuba. 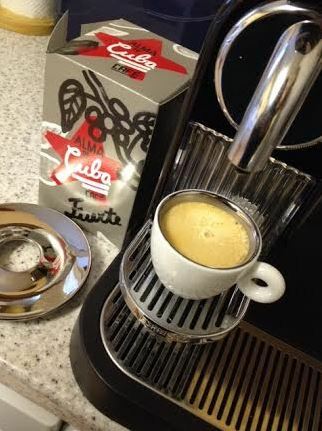 They are a small company trying to bring what little Cuban coffee there is left growing in Cuba to the market. Coffee, like chocolate, is a little more fussy and lower yielding than something like sugar cane which is easy and fast money for farmers. A lot of Cuban coffee has been pulled up for sugar cane which is a shame. Intense, bright but balanced, with wonderful silkiness and a lingering finish – is what the website says. I did a lot of testing with the capsules to find the right combination of length of shot and blend to get the best from these pods. This medium to high roast bean (which is 100% Cuban mountain grown Arabica) allows for the unique and consistent flavour of Alma de Cuba to infuse through but it also doesn’t allow for a length of time in contact with the bean. I find that Alma de Cuba regular coffee for my caffetierre is stronger than these pods. Through a carefully built partnership with the Cubans, Alma de Cuba is working towards supplying Cuba’s mountain coffee farmers, providing $4m in support to provide them with the tools they need to help re-establish Cuba’s coffee industry. 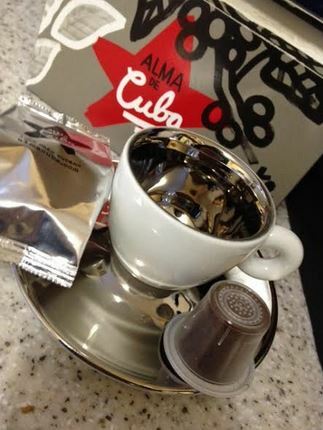 Alma de Cuba works hard to maintain a steadily increasing supply of top quality Cuban coffee (both green and roasted) for sale globally. This espresso is delightful and flavourful. On its own, you can get all the flavours of the bean which are absolutely highlighted by this roast. It isn’t just a burned mess as some espressos are with too heavy-handed a roast lending burnt notes to the coffee. This is just perfect to highlight the flavour of the bean. I should say, these pods were not without their challenges. I had one get stuck and one fall through the Nespresso machine. I’m still not comfortable using non-Nespresso pods in my machine but this one company I will entrust with my machine.